"The Truth About Halo, Part 2: Death and Remembrance!" Let's go deeper down the Halo rabbit hole. You might be looking at the issue number like "eh?" Yeah, weird as it may sound/look... part two of The Truth About Halo comes four-months after part one! Weird, right? We open with a white woman with an afro being approached by a shady looking woman who knows her by name... Denninger. She is led to the office of the mountain of a man known as Tobias Whale. The pale Whale is pleased by her presence, and asks his associate (addressed as Syonide) to gather the rest of the team at the Harper home. The following morning we get some hot tickling action by the warmth of crackling bacon by the elder Harpers. Here we learn that Sam and Margaret Harper run a lumberyard. There's a knocking at the door... which surprises them. Sam answers the door and receives a punch to the gut... as Whale's crew enters in search of young Violet. After a bit of protest, Mama Harper tells Syonide that Violet is upstairs sleeping. We get a bit of a look into Violet's head as she has the same nightmare we observed in part one. She wakes up and holds Syonide... thinking her Tatsu. Once she gets her druthers, Syonide ensnares her in her whip. With her kayoed, Sy makes mention of having killed this girl once already. The Harpers are brought to their own lumberyard for further unpleasantness. Inside the lumberyard offices we find Mr. Whale along with a Dr. Moon. He claims that Violet has a photographic memory... and she's got some information in her head he needs. They ain't buying her amnesia act... and threaten to do harm to her parents if she doesn't spill the beans. Of interest here, Sam Harper comments that Violet never showed concern for them before... why would she start now? Halo knows she doesn't have the power to "Halo up", so she triggers her Outsiders emergency alarm... and decides to vamp for some time. We shift to the Batcave where Bruce is in the midst of his weight-lifting regimen. Alfred directs his attention to the Outsider alarm, and they deduce that it is Halo calling out. Bruce then rallies the troops... and before we know it, they're headed west. Back in Missouri, Violet continues pleading the case for her amnesia. When it appears that her parents would be harmed, she begs Whale and company to hurt her instead. This makes her parents think maybe she's done some growing up in her time away. Dr. Moon attempts to reason with Whale, claiming his methods may be more successful than making threats. Violet is hooked up to some machinery, and Moon claims that her brain readings are unlike anything he's ever seen! At this point, the afroed Jane Denninger decides to try and fill some of Violet's history blanks. She learn that Jane is the sister of Violet's old (dead) boyfriend, Mark. She claims that Mark was taken with her almost immediately... and oddly shows a bit of jealousy. She continues by discussing an evening in which Violet and Mark came across a flaming car. The man inside begged them for help, and told them he's "make it worth their while" by flashing them some documents. Violet decides why settle for "some" when she could have "all", snags the documents... and allows the man to die in the car fire. From here we learn that those documents were the formula for a new highly-addictive drug... one that Mr. Whale wanted the exclusive "rights" to. Syonide begins telling her story... she followed the young couple to Paris, where she came across the dying Mark in a hotel room. She claims that Violet set it up to make it look like he'd died of an accidental overdose. Later, she followed Violet's trail to Markovia... where the two met... and Syonide shot her dead. During the whole time this backstory was being told, we got bits of the Outsiders making their approach... Brion flying under his own power, and the rest in a jet. Speaking of Brion, he bursts through the wall of the office... however, due to his weakened state from having flown at such amazing speeds, is easy prey for Syonide's whip. Just as Geo-Force goes down, the rest of the Outsiders burst on the scene. From here we get a pretty good fight scene. Metamorpho turns into liquid mercury to give a pair of goons the slip... and Katana straight-up stabs Dr. Moon... not fatally, mind you... but with intent to leave him in so much pain he'll wish she'd killed him. Syonide snares Halo with her whip again... only to be shot in the shoulder... by Sam Harper! It's enough to distract her, but little more. She gathers herself... and shoots both Harper parents dead. As they lay dying, Violet rushes to their side. She tells them that she finally remembers them. In the confusion, Whale and Company hightail it out of Dodge. We wrap up with Batman clearing things up with local law enforcement while Halo stands before her parents' graves. Katana approaches to comfort her, and we learn that when she told the Harpers she remembered them, she was lying to comfort them in their final moments. 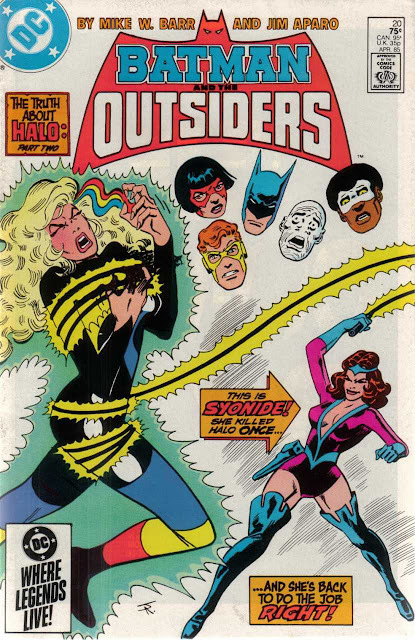 Another great soapy issue of Batman and the Outsiders. Mr. Whale is a pretty decent street-level crime foil for the team, and really fit well here. This, as the title suggests, is Halo... Gaby... Violet's story. We learn here that before she "woke up" she was kind of a jerk. It's no surprise her father was so tentative in regard to her return. We find out some pretty evil things she did... letting a dude die in a burning car... inducing an overdose on her boyfriend... yikes. We're venturing closer and closer to that "point of no return" here... which makes me really curious as to how they are going to redeem her at this point. I'm hopeful it's something creative... but fearful we're going to get something of a reset. I liked seeing the Outsiders rise to the occasion here. Especially Brion and Tatsu. Brion, arriving exhausted from flying the whole way... and still fighting... really spoke to how important Halo is to him. Tatsu's inner conflict about seeing Halo again was also quite touching. It was so hard for her to say goodbye the first time, how could she do it again? Looks like that's a moot point right now, but at the time, it was a powerful thought-bubble. So, yeah... it's a moot point... because the Harpers are dead. I'm glad Halo had her wits about her during their final moments to give them a bit of peace... even if what she said wasn't true. It spoke to Gaby being a different person since her awakening. This series is still proving to be quite the "sleeper hit" for me. I never expected these characters to draw me in like they have. I still urge anybody reading to give this book a shot.